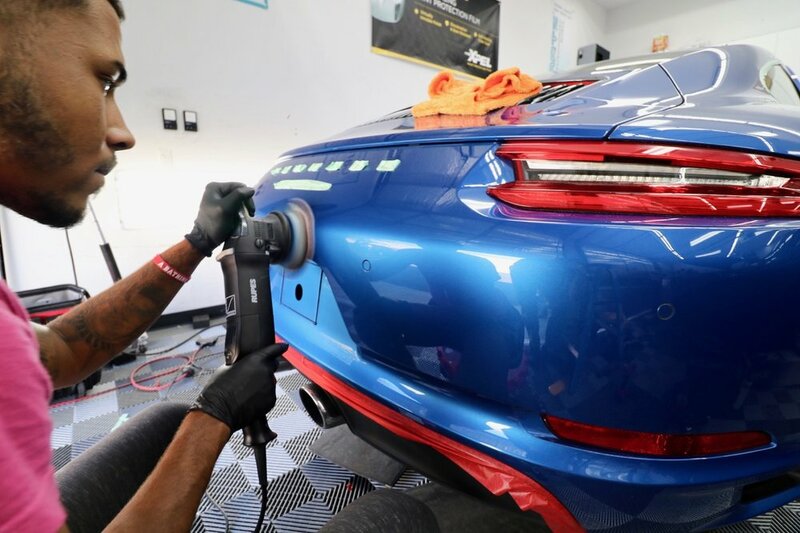 Paint correction is the art of restoring a painted surface to optimal gloss and clarity by removing surface defects and scratches with fine abrasive polishes and compounds. It is a honed skill that is far more than just a "buff". A true paint correction will remove surface defects and swirling permanently while also refining the paints surface to reveal stunning levels of gloss. What is a Multi Stage Paint Correction? Through the use of multiple abrasives at different levels of aggressiveness, a multi stage correction allows for the use of compounds in the beginning of the process in order to remove defects and scratches and "level" the painted surface on a microscopic scale. This step is then followed with finer and finer abrasive polishes to refine the surface and restore gloss and clarity. Why Does my Car Need Paint Correction? In order to achieve maximum gloss from your vehicle's paint it is critical that your paints surface be perfectly flat on a microscopic level. The Paint correction process levels defects and scratches allowing for crisp, mirror like reflections. In addition, Paint correction is also necessary to open the pores of the paint for optimal bonding of ceramic coatings like CQuartz Professional and CQuartz Finest Reserve. Does My Brand New Car Need Paint Correction? Unfortunately many brand new cars do require paint correction for them to look their best. It is very common for new cars to be delivered with paint that can have defects left over from factory sanding and finishing as well as washes at the port and dealership prior to sale. Condition varies greatly from car to car which is why we always recommend an in person consultation so that we can gauge what might be necessary to get your cars paint looking better than new!